Summary: Learn how to remove an old toilet, remove a pan with a down waste outlet, remove a pan with a horizontal waste outlet, install a toilet with a down waste outlet, fit a new toilet cistern and fit a toilet seat. There may come a time when you want to change your bathroom suite, which will inevitably involve replacing the old toilet. 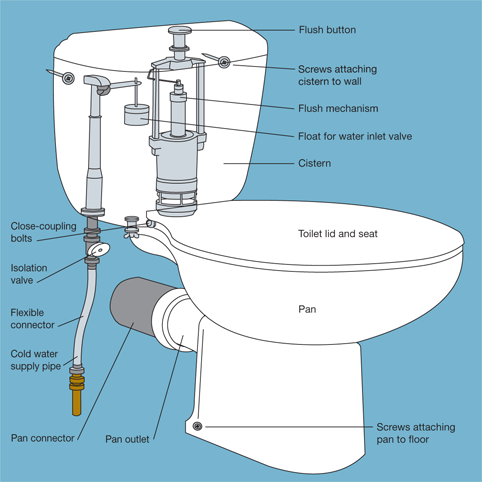 The method you employ to do this will depend on the type of toilet you are installing but for the purpose of this project we will look at fitting a new close coupled toilet (see diagram), as this is the most common toilet in use today. How you remove the old toilet depends on whether the pan has a horizontal waste outlet or a down waste outlet cemented to the floor. But first you will need to remove the old cistern. Turn off the water supply to the toilet cistern and flush the cistern to empty it. Soak up any water in the cistern and pan with some rags. Unscrew the cistern from the wall. Detach the overflow pipe and the water supply pipe from the cistern. If your new toilet is similar to the one you are replacing then you will be able to use the existing water supply pipe. But if the cistern is different in size or position you will need to install overflow and water supply pipes. However, with flexible connectors this is easily achieved. Unscrew the screws holding the pan to the floor. Disconnect the flush pipe joining the cistern to the pan. This is achieved by peeling back the cone connector or with older toilets chip away at the old putty sealant or mortar with a chisel but wear safety goggles to protect your eyes. This style of toilet will have the waste pipe cemented to the floor, so you will need to break the waste pipe just above the joint using a club hammer to free the toilet. Wear safety goggles when performing this operation. Block the waste outlet with rags to prevent debris falling into it when removing the mortar around the collar of the waste pipe with a club hammer and cold chisel. Wear safety goggles when performing this operation. Once all the mortar has been cleared away you are ready to fit the new toilet in position. 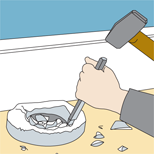 Remove the mortar around the collar of the waste pipe. Disconnect the flush pipe joining the cistern to the pan. This is achieved by peeling back the cone connector or with older toilets chip away at the old putty sealant or mortar with a chisel but wear safety goggles to protect the eyes. Carefully pull the pan away from the waste pipe in the wall with sideways movements to loosen the joint. If the pan does not come free you will have to use a club hammer to break the pan outlet. If mastic or putty was used for the waste outlet joint this needs to be chipped off the metal waste pipe in the wall. If your supply pipe to the toilet cistern does not already have a stop valve connected, use this opportunity to install one to allow you to cut off the water to the toilet in the future without having to turn off the mains supply. Whether you are fitting a toilet with a down or a horizontal waste pipe it is advisable to connect the pan with the cistern first. A close-coupling plate should be fitted onto the flush outlet on the underside of the cistern, followed by the large plastic nut that is supplied with the cistern. Two bolts should then be slid into place on either side of the close-coupling-plate. Position the large close-coupling-plate washer over the flush inlet on the pan. The cistern can then be carefully lowered into place directing the bolts through the holes in the pan. Slip washers into the ends of the bolts protruding underneath the pan and secure the cistern in place with wing nuts on the end of the bolts. Remember not to over tighten the wing nuts as this can result in the pan or the cistern cracking. Hand tight should be more than sufficient. Make sure the floor surface is undamaged, smooth, and clean. Insert a 90° pan connector into the waste outlet in the floor. The waste outlet pipe on the pan should now be fitted to the other end of the 90° pan connector. With modern connectors it is not necessary to seal this connection but it must be a good fit to prevent leaks. The new toilet should now be in position and needs to fixed in place. Using a spirit level across the top of the cistern check the toilet is level. If you need to make new fixing holes in the floor or wall, mark their positions along with the position of the base of the pan on the floor. Remove the toilet. If required drill the new pilot holes and plug them, then put the toilet back in position using the outline you marked on the floor. The drilled holes should be in line with the toilet's fixing holes. Putting a washer over the fixing holes in the back of the cistern, screw the cistern to the wall. A short screwdriver is best used for this because of the limited space inside the cistern. Screw the base of the pan to the floor ensuring a rubber washer is between the head of the screw and the pan. A bead of silicone sealant should be applied at the join between the base of the toilet and the floor using a sealant applicator. Follow the same method to install a toilet with a horizontal waste pipe, but insert a straight pan connector into the waste outlet in the wall instead of the floor. Fix a flexible connector onto the cold-water supply pipe. 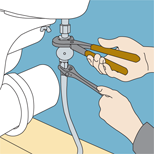 Connect the other end of the flexible connector to the cistern, bracing the inlet pipe with slip-joint pliers as you screw on the connector with an adjustable spanner. Fix another flexible connector between the cistern overflow pipe and the overflow outlet in the wall. The flush mechanism should now be installed inside the cistern. There are different types of flush mechanisms, the most common being the ball valve, the drop valve for push button toilets (these have an internal overflow), the siphon valve and the flapper flush valve. These all come in kit form with instructions on how to assemble and install. 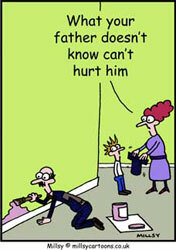 Turn on the water supply and observe the cistern filling to ensure it is working properly and that there are no leaks. Connect a flexible connector to the cold-water supply pipe at one end and the cistern at the other. Place washers over the holes at the back of the pan. Align the holes at the back of the seat with those in the back of the pan. Insert bolts through the seat and pan. Washers need to be fitted onto the bolts from underneath before securing the toilet seat with wing nuts. Secure the bolts with wing nuts from underneath. If the lid is stiff or falls down, you can solve the problem by unscrewing the nuts that connect the lid and pan, and readjusting the washers.